Country-Specific Market Assessments: Lighting Global is undertaking detailed market assessments on the productive use of solar in Kenya, Zimbabwe, and Cote d’Ivoire. These assessments include milk chillers and refrigerators for fish preservation, and the results will be published early next year. Market Segmentation: The LEIA (Low Energy Inclusive Appliances) Programme has undertaken research to identify the most common use cases for off-and weak-grid refrigerators and assess their respective market potential. This typology - built on evidence from previous off-grid refrigeration pilot deployments, the experience of off-grid sector first movers, case studies, and discussions with sector experts - will serve as a foundation for future research. Sales Data Collection: The LEIA Programme is supporting the expansion of GOGLA’s off-grid solar lighting sales data collection and reporting platform to include refrigerators, among other appliances. The first set of sales data will be published in April 2019. Global Market Research: The LEIA Programme is commissioning research to gather market data on appliances, perform analysis and modeling to characterize markets, and present the current state of trends, opportunities, and threats. This research project, which builds upon Global LEAP’s 2016 State of the Off-grid Appliance Market Report, will distill existing research and make use of stakeholder consultations, desk research, surveys, modeling, and potentially field work. The research undertaken will culminate into the flagship publication for the off-grid appliance sector. Retail Market Survey and Data Collection: The Efficiency for Access Off-Grid Appliance Data Platform is conducting market surveys in off-grid markets in East Africa, West Africa, and South Asia, to collect product-specific data, such as power consumption and retail pricing, at the points of sale. The market data informs the sampling of products for laboratory testing to develop a market baseline and share performance data publicly. Global LEAP Awards: The Global LEAP Awards are a series of international competitions that identify the world's lowest-cost and most energy-efficient off-grid appliances. The 2019 Global LEAP Awards, which launched on November 8th at the Unlocking Solar Capital Conference, includes the program’s second off-grid refrigerator competition. Please nominate eligible refrigerators for consideration in the 2019 competition via this link. Competition results will be announced in mid-2019. Refrigerator Field Testing: In partnership with Energy 4 Impact and with support from UK aid and Power Africa, Global LEAP recently concluded an off-grid refrigerator field testing process in Uganda as part of the last phase of the 2017 Global LEAP Awards Off-Grid Refrigerator Competition. A total of 36 refrigerators were installed in small businesses and shops to monitor refrigerator performance in real-life conditions, as well as assess the impact of these products on off-grid, low-income users. The field testing results informed the 3rd Innovation Prize of the competition, which was awarded to Palfridge. The Swaziland-based company’s LC86 product demonstrated market-leading innovation in appropriate design and user experience. Off-Grid Cold Chain Challenge: Global LEAP, Energy 4 Impact, and UKAid collaborated to develop the Global LEAP Off-Grid Cold Chain Challenge (OGCCC), an international competition to identify and promote the most energy-efficient, sustainable, and cost-effective technologies that can meet cold storage requirements for fresh fruits, vegetables, and dairy products. Ten finalist products were announced in August. The finalists will be deployed for field testing early next year and winners announced in July 2019. Vaccine Refrigerator Deployment: The Clinton Health Access Initiative (CHAI) and its partners, including WHO, Gavi, the Bill & Melinda Gates Foundation, and UNICEF, have worked to facilitate a competitive market for vaccine refrigerators across low-income countries, and to increase procurement and deployment of high-performing products that are affordable. CHAI has also directly supported select manufacturers in introducing or upgrading product lines to meet high-performance criteria cost-effectively. These incentives have increased the number of high-performing products from 5 products and 2 suppliers in 2013 to 59 and 8 suppliers in Q4 2018. Additionally, by 2021-2022, Gavi will have financed the deployment of around 100,000 of these high-performance refrigerators across more than 50 low-income countries. R&D Open Call: The Efficiency for Access Coalition has launched a new grant fund for research and development projects that accelerate the affordability and efficiency of a range of low energy inclusive appliances. Refrigerators are a target technology and eligible parties are encouraged to apply for funding by January 16. The first round of the R&D fund, with anchor funding from UK Aid, is worth at least £1 million. Appliance Data Trends: Insights on Energy Efficiency, Quality, and Pricing for Off-Grid Appropriate TVs, Fans, and Refrigerators: This report highlighted the need for consistent investment in R&D and technology transfer efforts in the off-grid sector to unlock the potential for product innovations and market scale-up. While an examination of market trends for off-grid appropriate refrigerators shows that demand is growing, penetration remains low due to a variety of factors, including the difficulty of last-mile delivery in off-grid areas and the lack of affordable off-grid appropriate refrigerators. Grid Powered Refrigeration for Productive Use: Energy 4 Impact studied 172 Ugandan micro-enterprises to better understand the case for off-grid appliances. The study found that, as a productive use appliance, refrigerators increase the earning capacity of non-retail related businesses and improve enterprise competitiveness. The economics of solar refrigerators at the time of publishing were not compelling, but the technology trajectory looks promising. Energy 4 Impact also found that a business case currently exists for energy efficient AC refrigerators for both on- and off-grid users. Market Baseline Performance Testing for Off-Grid & Weak-Grid Refrigerators: Negligible data currently exists regarding off- and weak-grid refrigerator cost and performance. To help fill this gap and accelerate this market – with support from UK DFID’s Ideas to Impact Initiative – CLASP procured and tested commercially available refrigerators in 2016 to establish a performance baseline. The report’s analysis indicated that there is some correlation between price and efficiency, with higher efficiency products costing more on average. However, the correlation is not strong and included outliers on both ends of the price and efficiency spectrum. 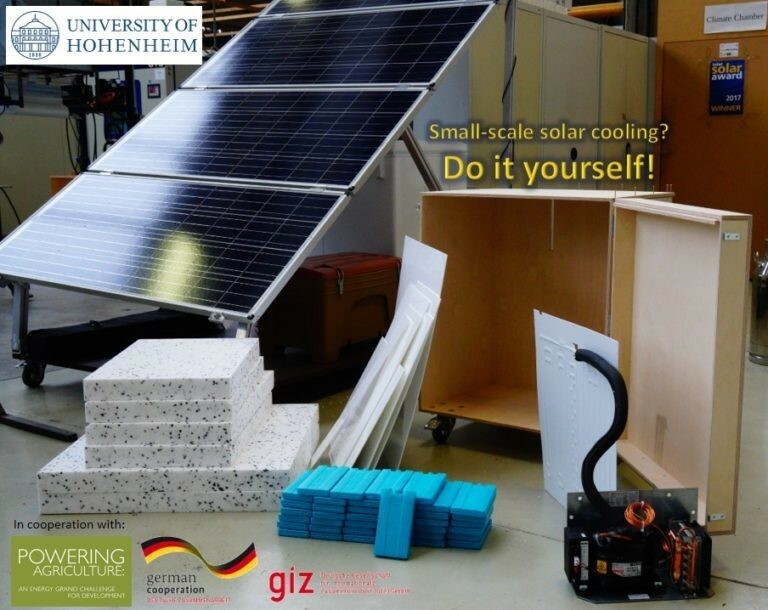 Do it Yourself: Small-Scale Solar Cooling Workshop: The Institute of Agricultural Engineering of the University of Hohenheim, Germany, in cooperation with Powering Agriculture (GIZ) are planning a workshop on do-it-yourself solar cooling to be held in Nairobi, Kenya in March 2019. This workshop will focus on the use of solar cooling units to make customized systems and participants will be trained to design, produce, and assemble products based on three hands-on example system. Are you interested in participating in our next technical working group meeting, peer reviewing reports, or providing input into the design of our upcoming market research projects related to refrigeration? Please express your interest here. To receive email updates about opportunities to collaborate with the Efficiency for Access Coalition on upcoming research projects, please register as an Implementing Partner. You can stay up to date on the Efficiency for Access Coalition’s work with refrigeration as well as other technologies relevant to off- and weak-grid settings by subscribing to our newsletter. You can also follow us on Twitter via @EforA_Coalition for more frequent updates.